My exposure to the Malaysian cuisine was restricted to the trip I made to Kuala Lumpur almost a decade ago and trying out lemak, laksa, rendang, sambals and satays in quite a few Pan-Asian restaurants in India. 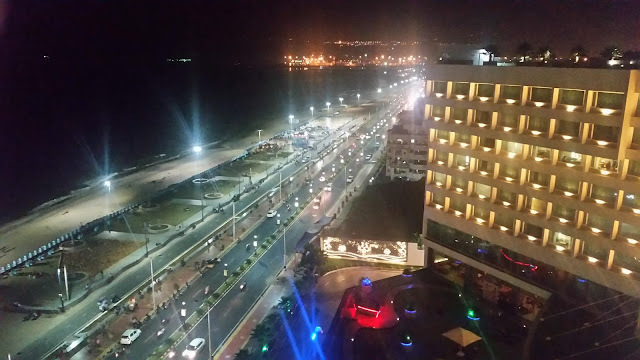 I remember there was a small restaurant called New Town Coffee House in Hyderabad who used to serve Malaysian cuisine and had to shut shop in a few months due to lack of interest from Hyderabadis. However, from the little that I had tried out, I developed a liking for this cuisine. 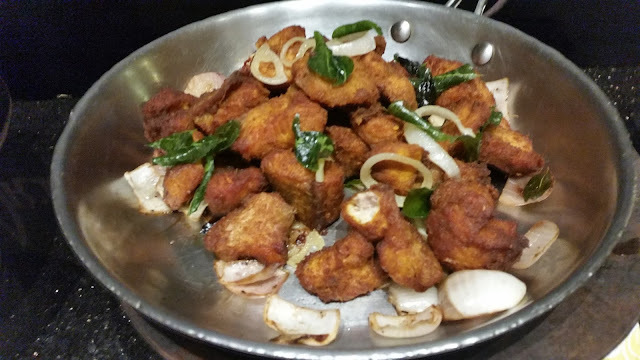 So, I was quite excited to be invited to a preview of “Flavours of Malaysia”, a festival celebrating the cuisine at Okra, the all-day dining restaurant at the Marriott Hyderabad. 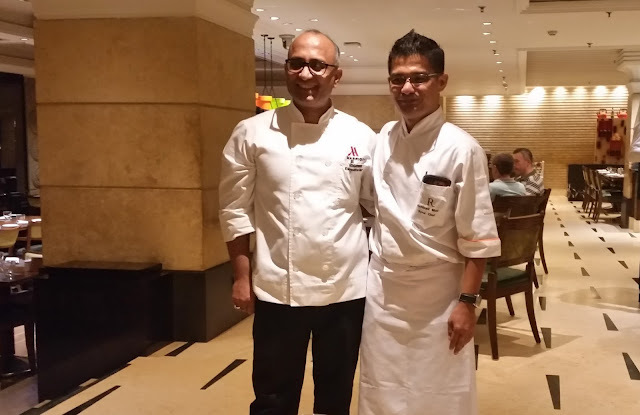 Chef Ruhizad from Malaysia has been flown in from Renaissance Hotel in Kuala Lumpur to curate the festival. During the discussions at the preview, Chef explained that Malaysian population consists mainly of people of Malay, Chinese or Tamil origin, but their cuisine has influences of other neighbouring countries too, especially Thailand and Indonesia. For the festival, the Chef preferred to carry quite a few ingredients from his home country. Although some of these are available here, he confessed his allegiance to some specific brands which he feels are way better. The festival items were part of the dinner buffet at Okra, and they were displayed nicely on one side of the restaurant. 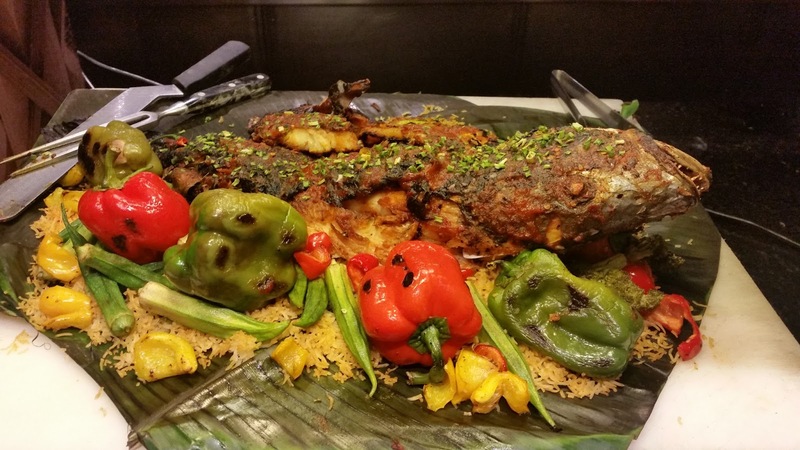 On a first look, the first item which got my attention was Roasted Red Snapper, which looked extremely attractive on a bed of rice and vegetables. The preview was more of a sit-down dinner, and items were served on the table. The starters were presented nicely on a platter. 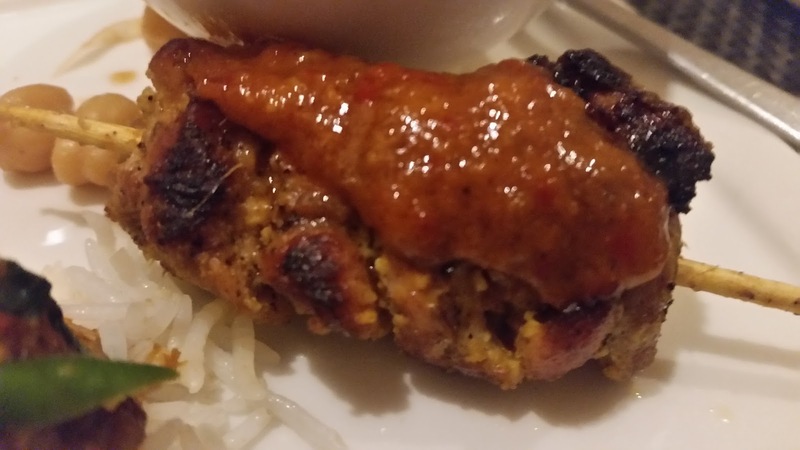 There were five items of which Chicken Satay was something we were all familiar with. I was surprised to see a fruit salad Rojak Buah among the starters but later realized that it served as a perfect foil for the non-vegetarian salads. While I loved the satays, the Bergedil Ikan or fish cutlets were soft with a distinct flavour. However, I would have loved a good dip with it. Then there were a set of salads known as Kerabu in Malay, the ingredients being lamb, seafood, and chickpeas. 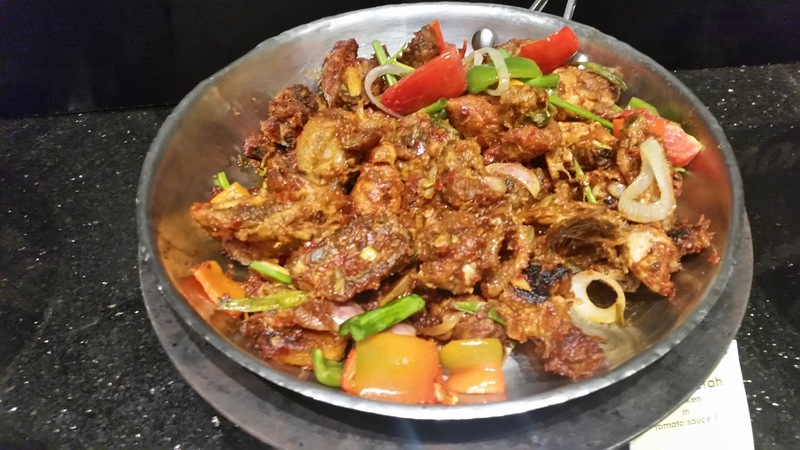 As per Chef Ruhizad, the main courses have been chosen in such a way that the diversity of the cuisine and its different flavours could be demonstrated. 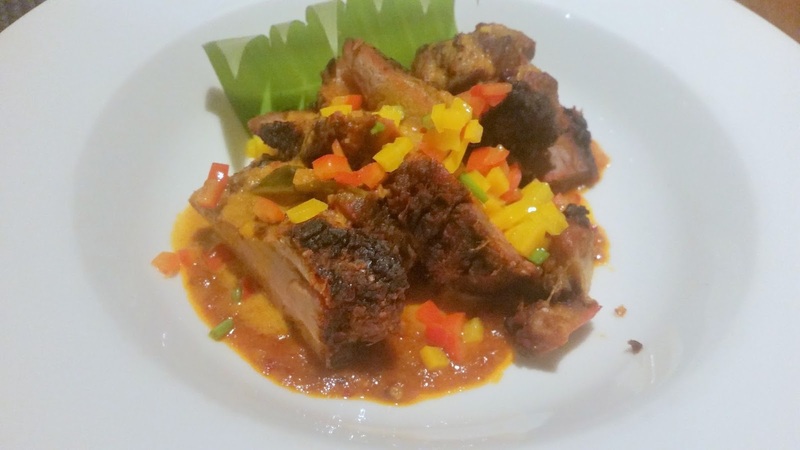 Kambling Bakar Percik Sauce or Roast Lamb was the pick of these dishes. The lamb was cooked to perfection and the Percik sauce in which it was served was a little tangy and delightful. Another dish which impressed my palate was Sotong Sambal. 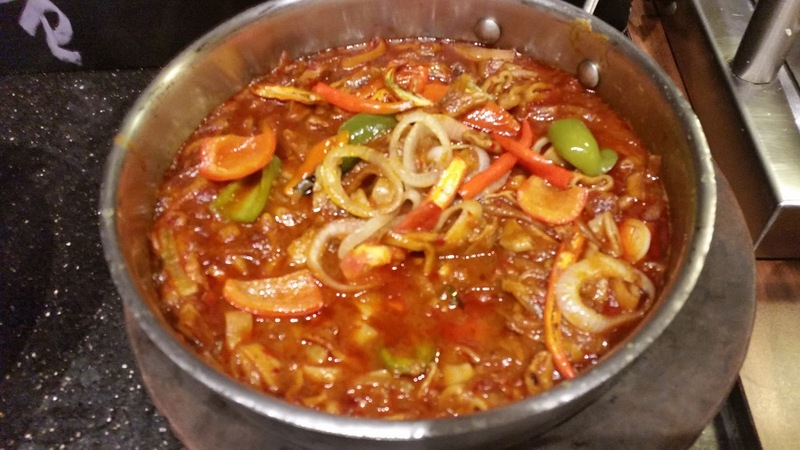 I am a squid lover, and the comparatively spicy gravy preparation with onions, tomatoes, bell peppers and chillies went very well with the steamed rice served along with it. The other non-vegetarian main courses were Ikan Goreng Berempah (fried fish with Malay herbs) and Ayak Masah Mera (chicken cooked with tomatoes and onions). I would rate them as decently good. The masala on Roasted Red Snapper, which I had talked about earlier was moderately spicy, and I enjoyed this fish dish. 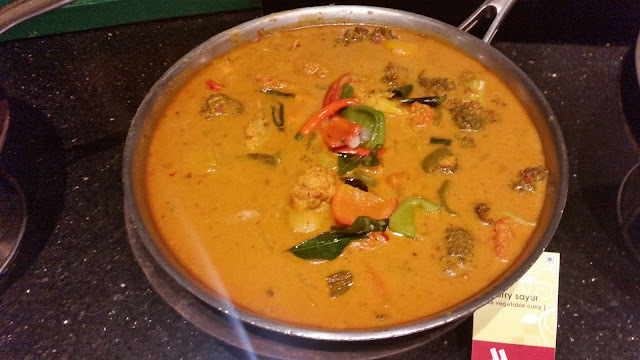 Among the vegetarian dishes Curry Sayur Sayuran or the mixed vegetable curry impressed. Again this flowing coconut based gravy was perfect with rice. I found the Kobis Goreng Kunyit Bercili (Fried Round Cabbage) a little tasteless. Apart from this, there was a potato based dish. 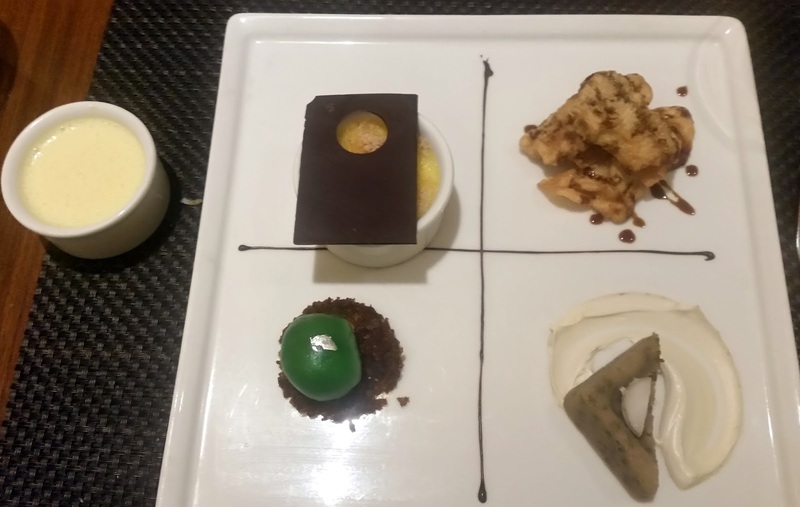 Lastly, there was dessert platter with four different desserts. I am not a dessert lover but liked the Pisang Goreng or fried banana fritters. Overall, a nice spread. Though I missed the more well-known dishes of Malay cuisine like Laksa and Nasi Lemak, it gave me an opportunity to try out many new dishes from different regions of Malaysia. I found Chef Ruhizad very forthcoming in having a little chat about the food with the guests, and enlightening them on the regional influences, recipes and ingredients of the food he serves. The “Flavours of Malaysia” fest is on till 29th May at Okra, only for dinner. 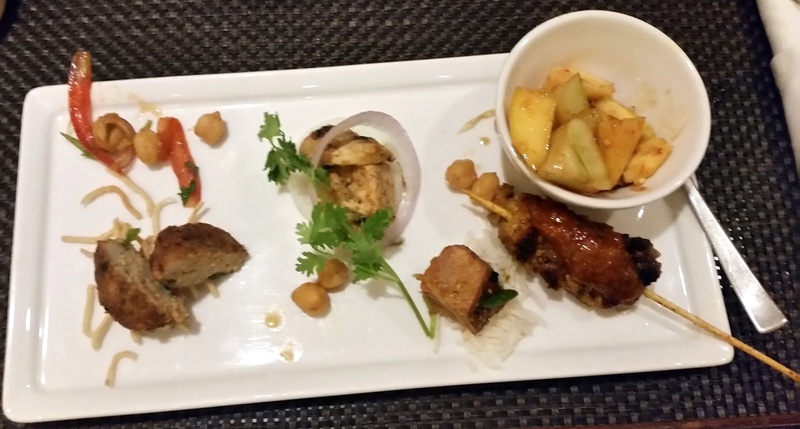 Food lovers interested in oriental cuisine will definitely find this worthwhile. The dinner buffet also has other items of different cuisines in it, apart from the signature Malaysian items. This is an impressive spread and good to see that they brought in lots of dishes which were uncommon.